1. 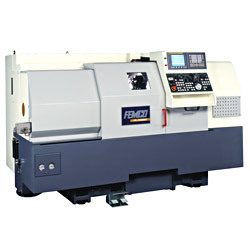 Description: the newest CNC lathe with SUB-spindle. (1) Innovative double disc turret with 23 tools; OD 12 tools, ID11 tools. (2) Every 11 ID tools can be equipped with power tool. (3) Power turret with the rear turning and milling function and sub-spindle combine to satisfy one set up machining. (4) Innovative pneumatic-driven clamping system, less pollution and energy saving. Capacity: 1. Max. swing over bed ø 535 mm. 2. Max. turning diameter ø 300 mm. 3. Max. turning length 500 mm. 4. Bar capacity ø 52 mm. Travese: 1. X axis 152 mm. 2. Z axis 500 mm. 3. W axis 550 mm. Spindle: 1. Speed 4800 rpm. 2. Chuck diameter 8". 3. Spindle nose A2-6. 4. Hole through spindle diameter ø61 mm. 5. Front bearing ID / OD ø100 x ø150mm. 6. Rear bearing ID / OD ø 90 x ø140mm. 7. Spindle motor type FANUC αP22 / 6000i. 8. Spindle motor power 11 / 15 kW. 9. Max. spindle speed torque 24.3 kg-m. Sub-spindle: 1. Speed 5000 rpm. 2. Chuck diameter 6". 3. Spindle nose A2-5. 4. Hole through spindle diameter ø52.5 mm. 5. Front bearing ID / OD ø85 x ø130mm. 6. Rear bearing ID / OD ø75 x ø115mm. 7. Spindle motor type FANUC ø6 / 10000i. 8. Spindle motor power 5.5 / 7.5 kW. 9. Max. spindle speed torque 9.74 kg-m. Turret: 1. Number of stations O.D. 12 tools; I.D. 11 tools. 2. Shank height for square tool 20 x 20 mm. 3. Shank diameter for boring bar ø32 mm. 4. Power tool shank diameter ø16 (ER25) mm. 5. Power tool speed range at axial 3000 rpm. 6. Power tool speed range at radial 3000 rpm. 7. Power tool motor type (servo) FANUC α30 / 3000i. 8. Power tool motor power 7 kW. Feedrate: 1. X axis rapid traverse 20000 mm/min. 2. Z axis rapid traverse 24000 mm/min. 3. W axis rapid traverse 16000 rpm. Dimensions: 1. Width 2600 mm. 2. Depth 1700 mm. 3. Weight 1600 mm.